Qualifying to use the pistol is about to get a lot more complicated for Marines. The service has adopted the new Combat Pistol Program, which replaces the longtime Entry-Level Pistol Program in marksmanship. Tens of thousands of Marines will be required to qualify with it each year. 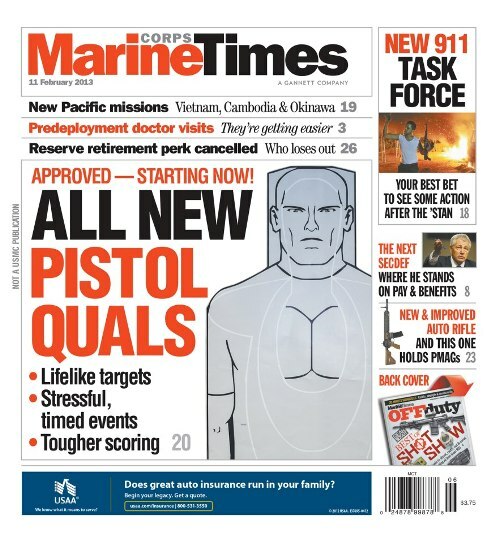 In this week’s Marine Corps Times cover story, we outline what the program includes and how it compares to the legacy pistol qual, table by table. Officials with Weapons Training Battalion, out of Quantico, Va., explain how the rollout of the new program will occur, and when. This week’s story also expands on our story last week about the new crisis-response force that Commandant Gen. Jim Amos told us about last week and provides a look at the latest version of the HK416 rifle, a variant of which serves as the Corps’ M27 Infantry Automatic Rifle. Also of note: A story that highlights how the Corps’ shift to the Pacific is ramping up. Two infantry battalions are now deployed to Japan for six-month rotational assignments, and we hit on what could eventually be coming.